Butter is dairy product made by churning cream or milk, which can be fresh or fermented to separate the butterfat from buttermilk. Butter usually used as a spread or for cooking. Generally, butter is made from cow’s milk but it can be also made from sheep or goats milk. Butter consists of water, milk proteins and butterfat. It is pale yellow in color. Today in markets can be found many different types of butter, which some are natural and some are made with pasteurized milk and have other added ingredients, beside salt, such as flavorings or preservatives.Butter does not contain many vitamins or minerals, but is rich in cholesterol and calories. In butter you can find large amount of Vitamin A and smaller percent of calcium and protein. They are approximately 50 percent of daily value of VItamin A, 5% calcium and 1 gram protein in 100 grams of salted butter. 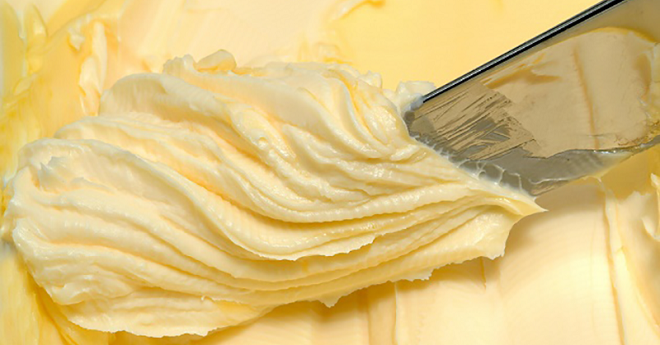 Butter also contain fatty acids (palmitic, stearic, lauric and butyric). For all butter lowers, in this article we present one recipe for homemade natural, organic butter, which is more healthy and in which more nutrients can be found. Preparation is simple and easy. Into food processor or blender pour the whipping cream and blend it for apprx. 7 to 10 minutes (until you notice that is turned into thick whipped cream). Continue to blend it until it turns grainy and separate into butter and buttermilk. When this is done, drain the buttermilk and scrape the butter and put into a colander (bowl used to strain off liquid from food) Here, you make sure that the rest of the buttermilk is strained and then rinse the butter with water with occasional stirring. When this is done, let it stand for 5-10 minutes to give time for the water to drain into holes and after, with use of, preferably wooden paddles or plastic spoons squeeze the butter to get rid of the remaining water and buttermilk. When all this is done, transfer your homemade natural butter into a small glass jar and little bit salt by taste, stir well and put the jar and keep it in refrigerator. This homemade organic butter, kept in refrigerator can last for a month before it get spoiled, but for sure you won’t keep it that long. We hope you will find this recipe useful and will try it. Enjoy in your homemade organic butter.